What the… where did this come from? The Apple Catalog? Summer 1993? That implies I have somehow carried this though something like 8 moves and never knew I had it! Seriously, I wasn’t exactly “saving” this one until NOW. Wow, this is a gem! 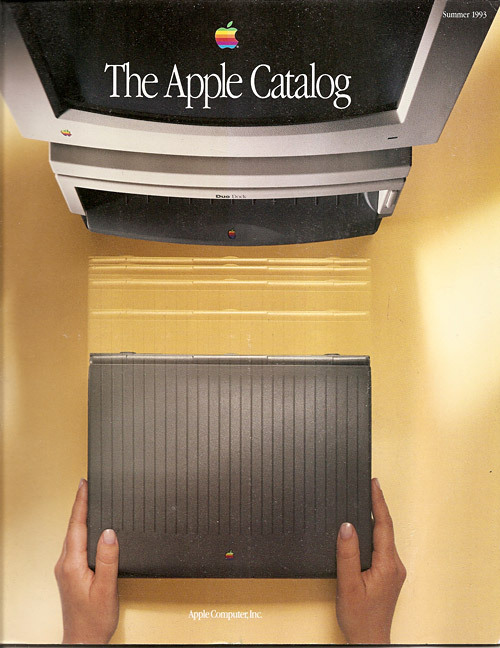 At 9×11 and 56 pages, this monster catalog displays Apple in one of its finest years. The cover shows the Macintosh PowerBook Duo 210 and DuoDock, one of the featured products that summer. It was a laptop. It had a trackball, yes, a trackball, and TWO mouse buttons. Screen resolution was a whopping 640×400, and it came with 4 MB of RAM! This was the smaller of the PowerBooks available at the time, the better one being the 165c. Can you wrap your head around the awesome speed of a 33 Mhz processor? How about the virtually realistic imaging that comes with a 256 color display? For an extra $300 you could even get a build in 14.4 modem. There are so many things in this catalog I would love to share, but I simply do not have time to scan the entire catalog. Instead I will just touch on a few of my favorites. First, the ImageWriter II printer, AKA the printer that wouldn’t die. In case you don’t remember, this is THE dot matrix printer that defined a decade, and as evidenced, was still selling strong in 1993 at $439. It was sold from 1985 through 1996, despite the introduction of inkjet and laser printer alternatives, and became Apple’s longest running product ever. I still have one. Next, the Apple Ethernet NB Card. Why NB? Why NBot! An Ethernet card was not standard on computers in those days. In fact it was a $349 upgrade. “This card lets you connect any Macintosh II computer to IEEE 802.3 Ethernet networks. You have the choice of using AppleTalk (Phase 2), TCP/IP, or DECnet”… DECnet? Really? There was even a 1MB memory expansion available for the card for $159. Of course, you also had to buy the software TCP/IP Connections for Macintosh for $59 (single user license) and TCP/IP Administration, $199. Let’s pause here for a second and understand what we’re getting into. This is 1993. There was no World Wide Web. There was no www.apple.com. How many of you were on the internet in 1993? How many of you had a computer with networking in 1993?? These were things academic people needed. It cost $766 extra dollars for a professor to be able to send email to other professors from his Mac. Apple even sold a router back then (so you could connect the whole lab). That was $499. Unfortunately none of these items are actually pictured in the catalog except the NB card. By the way, NB stands for NuBus. Also, I have to give props to the wide range of products Apple offered for people with disabilities. As you read through these, keep your iPhone in mind, and realize that a lot of the technology you think is cool has actually been available from Apple for almost 20 years. Co:Writer “the intelligent word prediction program, is a useful tool for anyone who struggles with writing due to learning disabilities, language deficiencies, or physical limitations” or because they are driving! “it employs artificial intelligence to help predict and complete the words a writer wants to write – and adapts to a user’s style as he or she writes.” End quote. Not bad for 1993. Or how about TouchWindow? “Especially helpful for users with limited motor abilities and cognitive disabilities, TouchWindow mounts easily over your existing display, enabling your Macintosh to respond directly to touch instead of mouse commands.” ScreenDoors, “When using a conventional keyboard is out of the question, ScreenDoors software puts a keyboard on the screen … A built-in word predictor learns your vocabulary as you type.” Virtual Telephone “Virtual Telephone gives you 200-number speed dialing, an on-screen directory, and more – all activated by any point-and-click device, or by voice recognition. Includes a wireless headset that lets you place calls by voice command from within 400 feet of your computer.” And lastly, Canyon Converter which lets you “use your wheelchair battery to power your PowerBook”. Makes me wonder, what kind of cool next-gen software is being marketed to people with disabilities today? Maybe I should pay more attention.